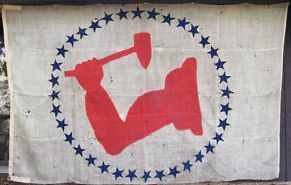 Posted on ebay, this Socialist Labor Party flag has 36 blue-stars. If the 36 represented U.S. states, then this would be c. 1865-1867 (unless the stars represent something else). "An unusually large flag at 6x10 ft. that has clearly seen extensive outdoor service...quite possibly in some sort of SLP headquarters capacity, given its huge size. It is entirely hand-stitched of early single-warp wool bunting using the traditional 'single-appliqué' construction method that produces fractionally smaller figural components on the reverse side. It might be noted that by the turn of the century, all hand-sewn flag construction had been all but eclipsed by the arrival of assembly line machine-sewn flags." According to the slideshow on the following web site: www.slideshare.net/kim_munson/evolution-of-an-emblem-the-arm-hammer, the symbol goes back to the 18th century in America. The SLP did not formally adopt it until the early 20th century (although it was in use by them earlier, but not exclusively so). Arm & Hammer Baking Soda (and other products) have been using the symbol since shortly after the Civil War. As a universally recognized generic symbol of labor, it has been used since the 1790s (or perhaps earlier) at least until the early 20th century. I doubt the SLP connection but who knows.